The Beatles Through The Years: Calling All Beatles Fans: Are You A Beatles Fan? Of Course You Are! Calling All Beatles Fans: Are You A Beatles Fan? Of Course You Are! Beatlemania: Fans surge a police line at Buckingham Palace to see the boys get their MBE medals in 1965. We are updating our pages here at The Beatles Through The Years and we are adding a fan page because, we are fans and so are YOU! 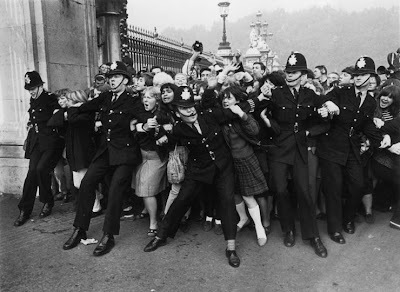 We're looking to tell the story of the fans so we need a short piece on who you are, your age, when you first heard the fab four, why and how you became a fan of the boys, if you ever seen the Beatles live or if you've ever been lucky enough to cross paths or even hang out with any of them! You can also include a picture of you that we will put beside your story. If you don't want to send a picture or tell us your age then that's fine but a little piece on your Beatles fan story would be fab. This will go up on our new fan page for the world to see and you can be assured that your story will be up there for posterity. If you want to be included, just shoot me an e-mail at beatlesthruyears@hotmail.co.uk with your story of your personal Beatlemania. Name: Caitlin Clark. I have a blog I started on here as an assignment in college, called Music N' More. My age is 22. I first heard The Beatles when I was in high school. My mom was playing their 1 album on the stereo when we were cleaning the house one day and the just general pop rock sound of their music attracted my attention. Since 12th grade, I've been a fan. Since then, I've also discovered other bands from that time period, such as The Rolling Stones, The Who, The Kinks, and other British bands, such as Led Zeppelin, Deep Purple. I've never been lucky enough to meet any of them or see them in concert as when I started listening to them it was in 2008, not 1964. Although my mom is convinced I should have grown up in that period. I would have gone to a Beatles concert.